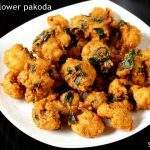 Cauliflower pakoda or gobi pakora recipe – Crunchy and delicious pakoda that I happened to make recently for a evening snack on a weekend. Made in South Indian style, these are very flavorful and the entire house fills with an exciting aroma. These are best served hot with a cup of masala chai as they begin to loose the crunch when cooled down. 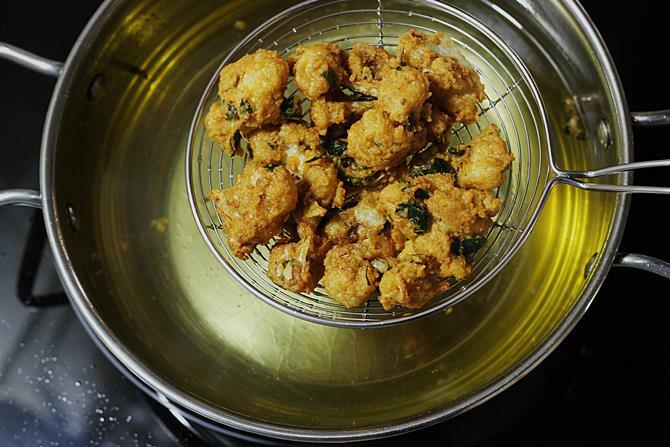 To make these cauliflower pakoda flavorful, we need to use a good garam masala and curry leaves. If you do not have curry leaves, they can be replaced with pudina/mint. You can also use both. 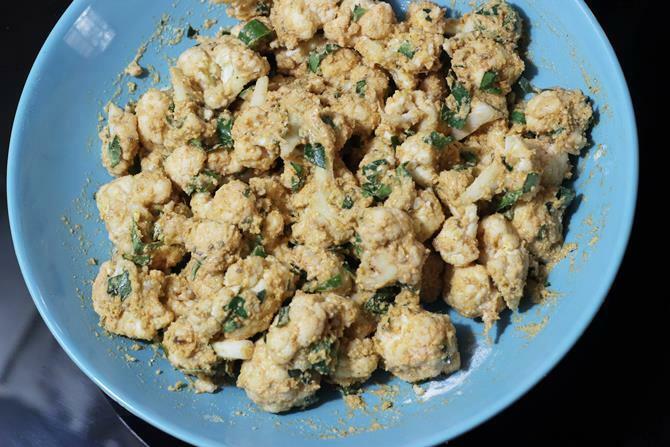 Similar Cauliflower recipes – Gobi manchurian, Gobi 65, Aloo gobi masala. 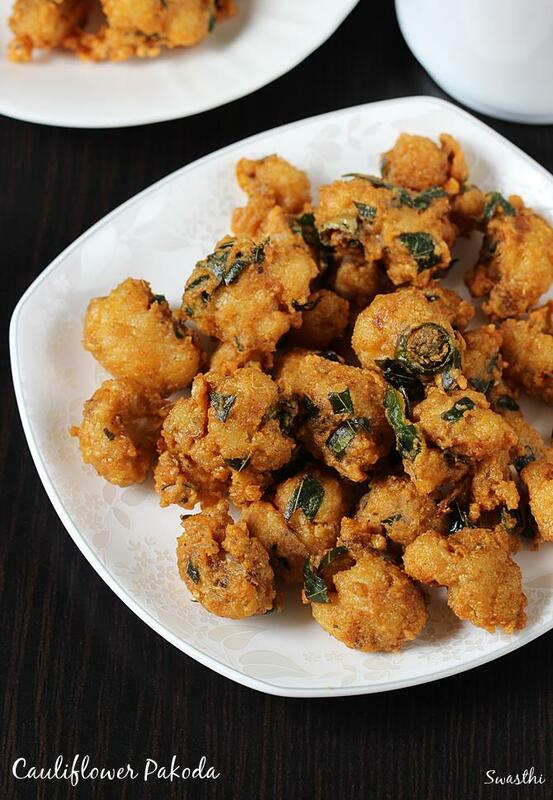 Cauliflower pakoda are a quick deep fried snack from India. These are usually enjoyed with a cup of tea or coffee for a evening snack. 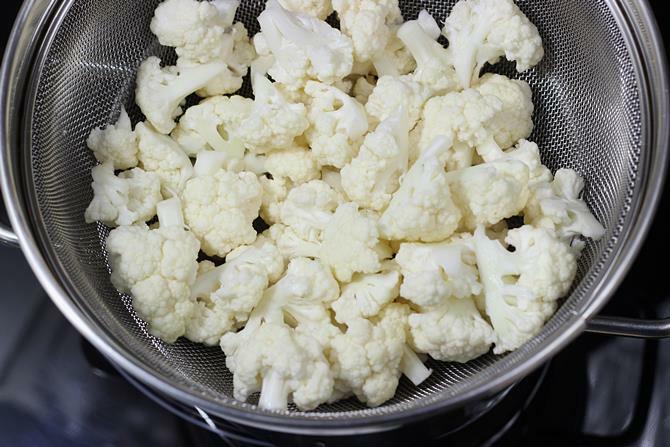 Add cauli flower florets to salted hot water and leave for sometime. Drain the water and rinse them thoroughly. Drain in a colander. Add them to a mixing bowl. Add ginger garlic paste, curry leaves, green chilies. Sprinkle chili powder, carom seeds and garam masala. You can also use chaat masala if you prefer. Mix well. Evenly sprinkle the flours and salt. 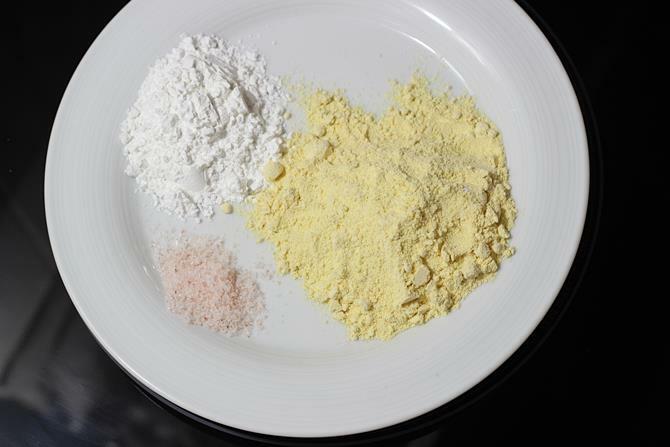 Sprinkle water and coat the gobi well with flours. Use water as needed. Heat oil in a fry pan. When the oil is hot enough fry until golden on a medium heat. 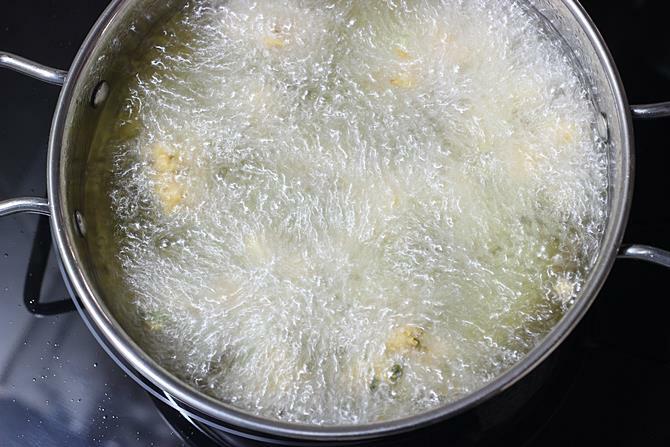 The bubbles in the pan reduce when the florets are fried well. Drain on a kitchen tissue. 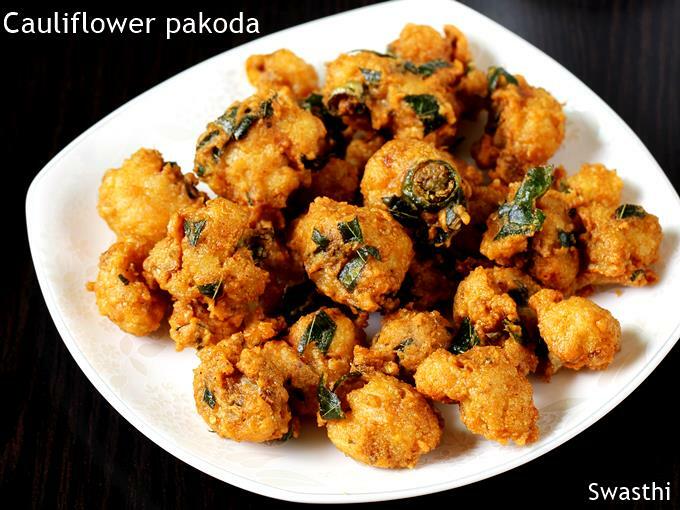 Serve cauliflower pakoda hot with a cup of hot tea or coffee. 1. Heat 4 cups water in a pot. 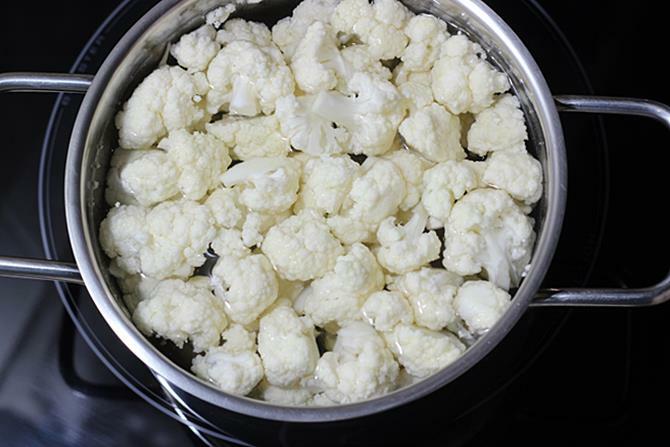 Clean the cauliflower florets and add them to hot water. You can also add some rock salt and turmeric to get rid of the worms and pesticide residue. 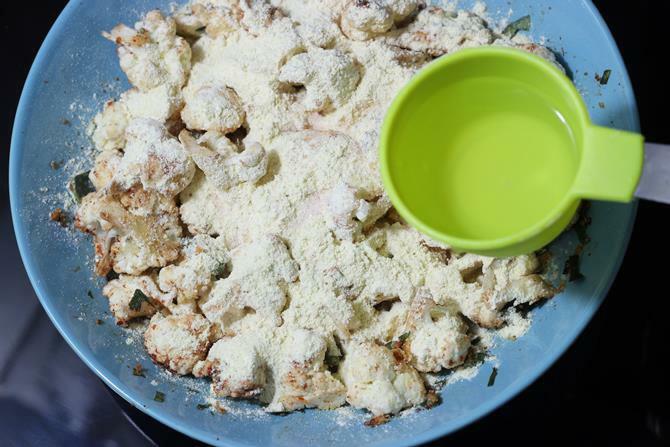 I used about 300 grams of cauliflower florets, about 3 heaped cups of florets. 2. Add them to a colander, rinse them well under running water. Drain them in the colander. 3. Wash curry leaves and chop or tear them. Cut green chilies, make a fine paste of ginger garlic. We need 2 sprigs of curry leaves, 1 ¼ tsp ginger & garlic paste, 1 ½ tsp of ajwain / vaamu, 1 tsp red chili powder, 1 tsp of very good garam masala. 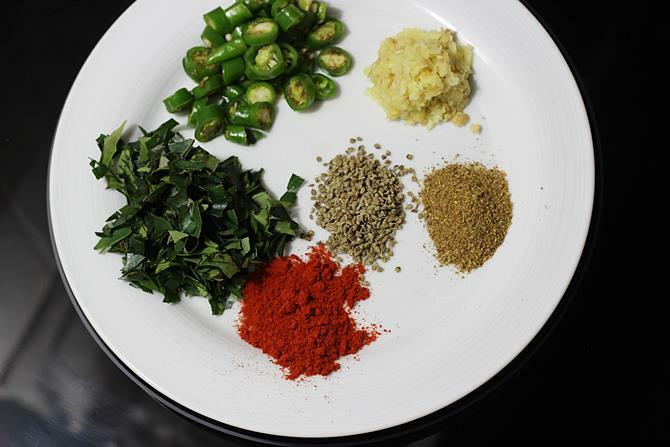 If you like you can also add little chaat masala or amchur powder. I haven’t used them. 4. Flours to use: Besan: ¼ cup + 3 tbsps or 7 tbsps , rice flour: ¼ cup or 4 tbsp . You can also substitute 2 tbsp rice flour with 2 tbsp of corn flour. For health reasons i have not used corn flour. Mix together the flours with salt and generous pinch of hing. 5. Firstly sprinkle evenly garam masala, chilli powder,ajwain. Also add garlic ginger paste, curry leaves and green chilies. You can also use 1 coarsely crushed onion. 6. Mix everything well. Cauliflower will begin to smell very good. 7. 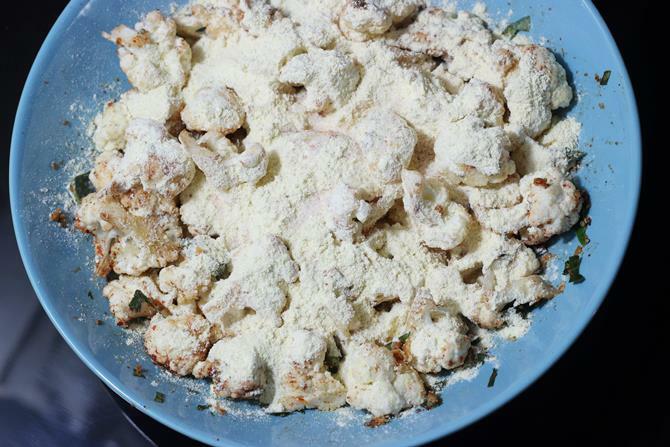 Sprinkle the salted flour mix evenly. 8. Sprinkle water as needed. Do not pour as we are not making a batter here. We just need to coat the gobi with flours. 9. Mix everything well to get a mixture like you see in the picture. 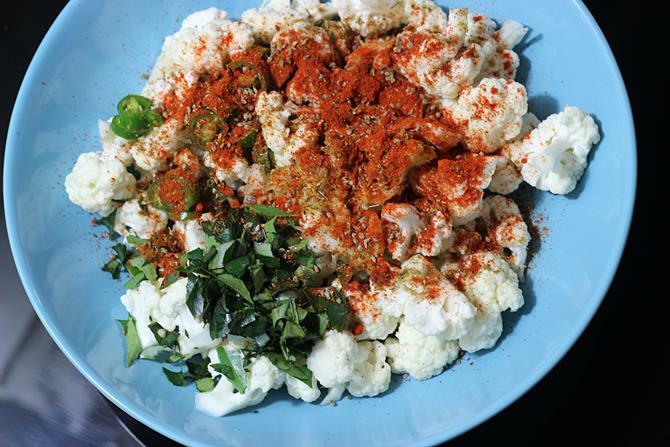 Flours must coat the gobi well without any drippings. 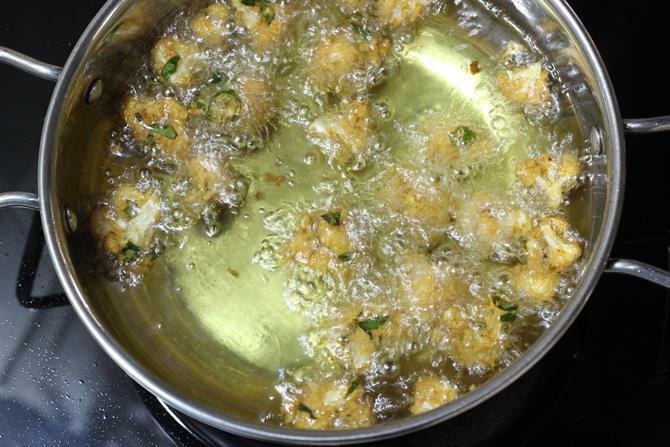 Adding more water at this stage may make the pakoda very oily and the frying time will increase. You can also add more flour at this stage and mix. 10. Heat oil in a kadai on a medium heat. Drop a small portion of the dough to check if the oil is hot. If the oil is hot enough, the dough rises after few seconds. 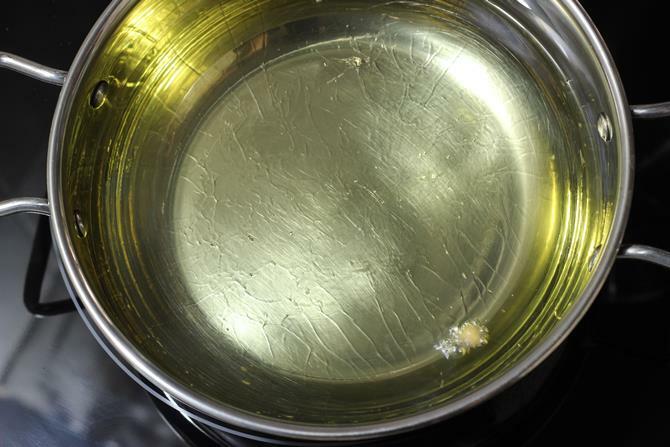 Do not heat the oil until smoky. 11. 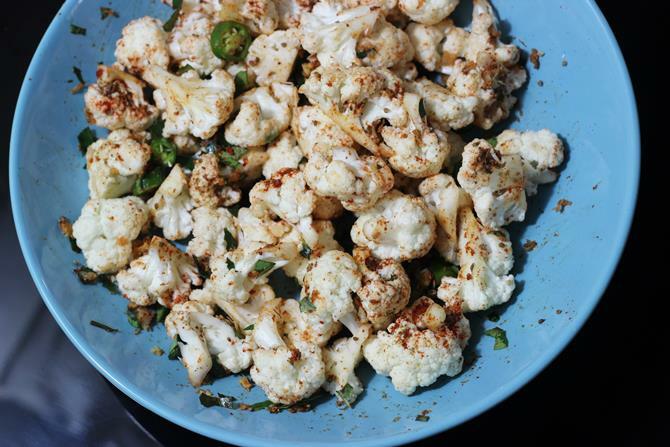 Drop the cauliflower florets in hot oil. The oil will begin to bubble a lot as the florets are dropped. Adjust the flame as needed. Make sure it is medium and not high. 12. Keep stirring in between to fry evenly. When the cauliflower is fried well, bubbles reduce on their own. This is the right time to get them out of the oil. Also they turn golden. 13. Drain them on a kitchen tissue. Serve hot. 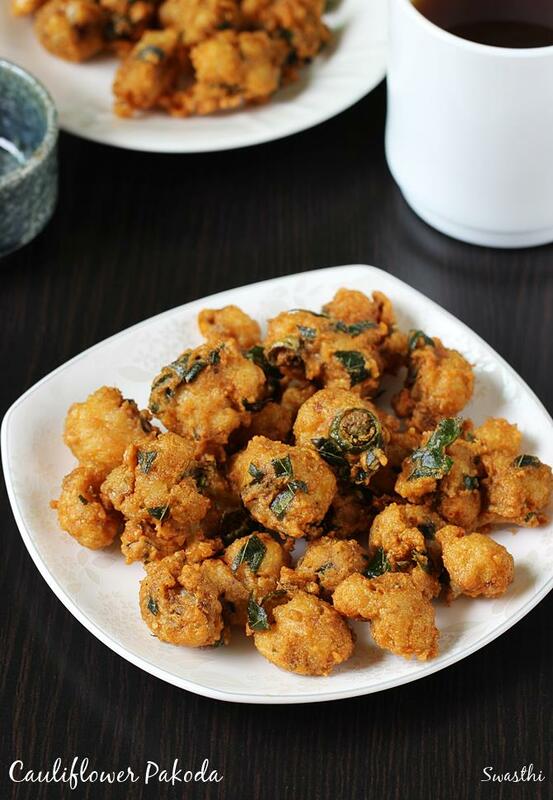 These cauliflower pakoda need no chutney, they can be served with a cup of tea or coffee. I made this today. It was delicious and my daughters love it. thank you so much swasthi. whenever I had doubt in any recipe, your blog will be my first visit. Thank you so much for following the blog. So glad to know your daughters liked the cauliflower pakoda. Thanks again! I tried this today. tastes great.. It was very tasty..
Can you let me know how to print the recipe? Thanks for trying. There is no print option on the blog. I tried it today . Taste was too good but only thing was it was not crispy even after adding soda . Wats the reason? Thanks for trying. My recipe doesn’t call for soda. Made these today – had to leave out chillies as my friend can’t eat them. A great success! I made this (with some liberties) and it was delicious. Pretty easy to prep and make, and came out nicely first try. Thanks for sharing this recipe! Why is it spelled “pakoda” and not “pakora”? I’ve seen this basic idea at Indian restaurants spelled with an R. Regional? Just curious. You are welcome. Thanks for sharing the outcome. Pakora is in hindi, the national langauge of India. Many north Indian regional cuisines too use this “ra”. While in south Indian regional cuisines,, pakoda / pakodi is commonly used. But there is also a slight difference in the recipes, the south indian versions, (mostly andhra) are more crunchy and even sometimes spice powders like garam masala are used. Yes Diya, when deep fried most foods shrink. This pakora recipes are delicious.Thank you. Hello Swasthi, I have been getting a lot of ideas for daily, healthy meals from your blog. You have introduced me to Jowar grain and many ways to use eggs. I love your blog and step by step pics are hugely helpful. Just wanted to drop a thank you to you for sharing your beautiful blog with us. So happy to know this blog is helpful to you.